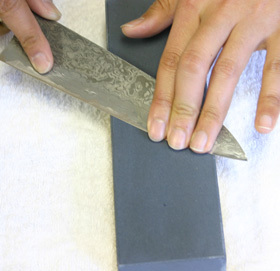 Start with the tip of the blade at the front of the stone at a 15 degree angle. Not any steel though - A regular steel with a hardness of approx. 62HRC will not touch Japanese VG10 steel. The MAC Black ceramic honing rod is like no other we have seen before and is perfect for the job! Click below to find out more. ​Hiltons will sharpen almost any blade. It is sometimes impossible to sharpen a knife on a domestic sharpener and you may need a professional sharpener to re-hone your knife and get the sharpness back. 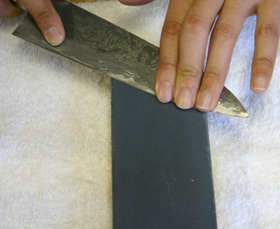 Knives can also get damaged and a professional sharpener will be able to remove a chip in a blade. 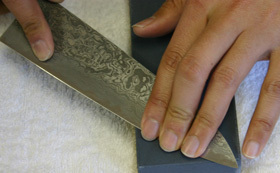 Hiltons Mobile Sharpening Services offers a full sharpening service for both domestic and commercial customers. Using a whetsone wheel and leather polisher Chris uses a gradual process that has been honed over many years. The company offers an excellent service, customers comment that their knives are returned ‘like new’. They are based in Nantwich and offer a mail order service.